This Christmas I will be again donating to Share The Dignity “It’s In The Bag” campaign. The principle of it is that you grab a bag and fill it with every day things that a woman who is homeless or fleeing a domestic situation might need, the little things we all take for granted. The idea is that you fill an old handbag so the person also get a new bag they can use. I don’t have any handbags so I made some tote bags to fill with my collected items. 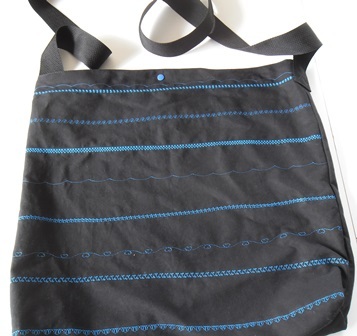 I decided to make basic cotton tote bags and change the design on the front to make each one different. I have wanted to make a button front bag for a long time, it was one of those random things that I see once and think I want to try that idea out sometime. A few months ago I brought jars of different coloured buttons during a sale, at the time I had no plans for them but they were perfect in this project. 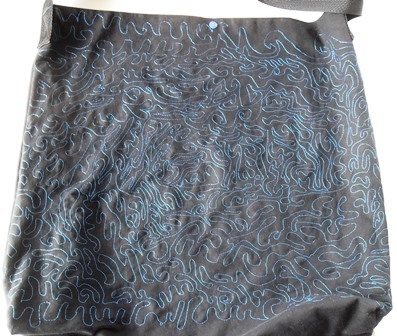 On the front of the bag I drew out a rough spiral shape, I randomly pulled out buttons from a jar of blue buttons and hand stitched them on using the same thread tying each button off as I went so if one came undone they all didn’t . Once I completed the spiral I then went through the jar and found a heap of the same small blue buttons so I made a second spiral with these. This was a lot of hand sewing in front of the tv work but I am happy with the result and I made a button bag. Originally I was going to do all 3 bag fronts in buttons but I realised it would take way too long. After deciding there was no way all 3 could be buttons I decided the second bag would be done with free motion quilting. 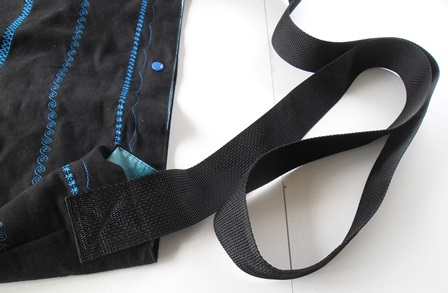 I used the same metallic blue thread that I used on the button bag. I was trying to think back to all the things I learnt when I did the class with Deb Louie. I had a rough idea where my seam lines would be so I just went about going from section to section with my quilting filling the bag front with stitches. I didn’t follow a pattern, I managed to get a heart or two in there and I am very good at doing curls or waves. This reminded me of when I was a kid I would get a black pen and on a piece of blank paper randomly draw lines and swiggles to create little sections that I would then colour in with different colours. Free motion is a lot of fun and I really should do more of it. I used tear away stabiliser on the back of it, removing it was another tv job as there was lots of tiny areas that I had to remove the paper from, again it was worth it. I am actually a person who does use those fancy decorative stitches that are on your sewing machine, they are a great way to jazz up a plain piece of fabric and that is what I have used them for on this bag. I used the same metallic blue thread again and just randomly selected stitches on the machine to do a row of stitching across the front of the bag. I never measured anything out I did a row of stitching at the top, bottom and about the middle of the bag all by eyeballing the placement. I then in my head divided up the areas and did rows of stitching to fill in the sections. I decided less was more not doing too much as I didn’t want the front to look too busy. I did squeeze in my favourite heart stitch design because if I can add in a heart particularly a blue one I’m going too! For the front of the bags I used a cotton drill fabric, this wasn’t from my stash but I did buy it in an Easter sale. On the insides of each bag I have used a cotton that had been in my stash after buying it on sale a few years ago. A few months ago I almost gave it away but held on to it so it was great to use it in these bags, the remainder of it I have cut up and used for WIRES pouches after doing to the burn test and discovering it was 100% cotton. These are crossover the body bags. For the straps I used some nylon webbing I had in my stash. I just stitched the straps the outside of the finished bags. The webbing is about 2″ wide so nice and sturdy. Confession I did make the straps too long. I over estimated the length so they ended up hanging towards your knees and not near you hip, I only discovered this after they were finished and I had taken the above photos. I didn’t want to cut the straps otherwise you would have ends you would need to cover up to stop fraying. My solution to the strap situation was to fold the excess webbing and stitching down as a decorative feature of the strap. It is a little hard to describe. At the centre point of the strap I folded it and ran my fingers down about 6″ and pinched the straps so you had a loop of excess strap at the top, this was the amount that I had to stitch down. 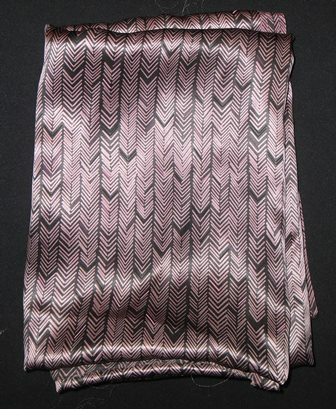 I decided it would be better if you had this excess fabric on the inside of the strap so it would like another layer of support against the shoulder. I separated the loop at the area where I had it pinched and folded the sides in so that the loop was now folded down to the underside of the strap and not the top. I flattened the loop into a rectangle and clipped it into place. On the outside of the strap you now had 2 folds that need to be held together. I did the widest zig zag I could over these 2 folds to secure them down, going over the fold a few times until I was happy the would stay in place. I did this on each bag. 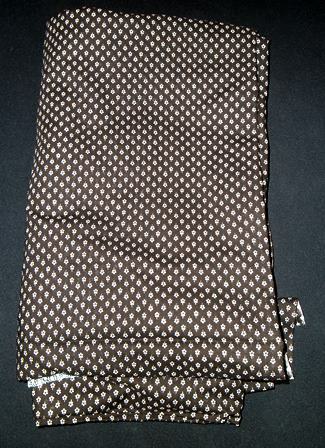 I then changed to a straight stitch and went around the flattened rectangle twice on each bag to secure it into place. I only got away with this because I used black thread on black webbing. It doesn’t look too odd, I have seen bags that have added support at the shoulder so that was the look I going for. When something goes wrong call it a design feature. I am happy with these bags, they are big enough to hold all the items I have been collecting this year. Making them was a lot of fun, I got to be creative and try out ideas. I had to overcome problems with the straps so I had to think. 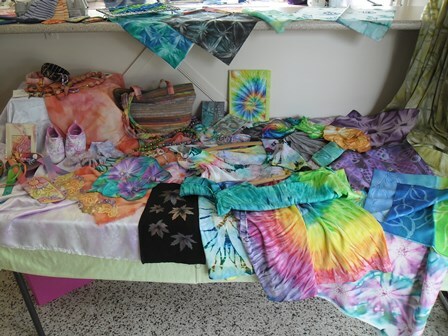 I used up a lot of items just sitting in my stash. 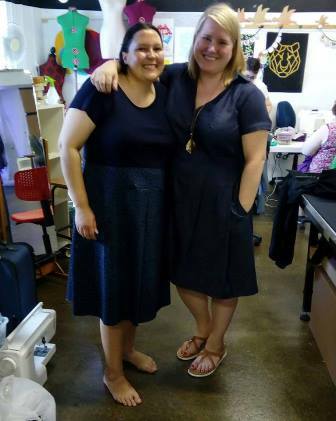 I love sewing for charity, I love that I can help with someone using the simple skills that I have. 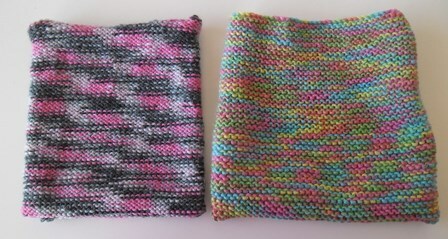 I have been knitting the outer pouches for WIRES for a number of years. The outer pouches need to be made from 100% wool so that the animals once placed in cloth pouch linings can still breathe inside this outer pouch. A rescue career only goes through about one of these outer pouches a day per animal as opposed to the 5-6 they go through of the inner pouch linings. I could never find set a knitting pattern only guidelines on finished size and needle size so over the years I have been knitting these various ways. I started by knitting 2 squares and seaming them along the 2 sides and bottom to make up the pouch until I realised if I knitted one big rectangle and folded it in half I wouldn’t have to do a bottom seam only side seams. Over the years the way I do my seams has changed I have tried whip stitch, blanket stitch, backstitch and in recent times I have been crocheting my seams together with a chain stitch. 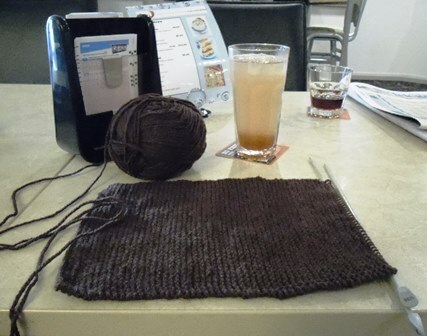 I have a tendency to knit my rectangles and once the piece is off my needles place it in a bag waiting to be seamed. 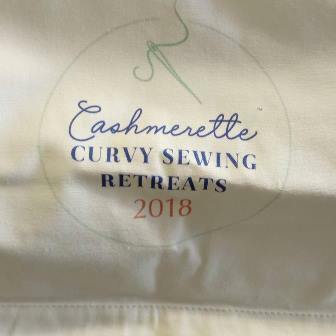 I only remember to the seams when I’m due to send of some of the cloth linings off and scramble to see if any of the outer bags are complete. I thought there has to be a better way. 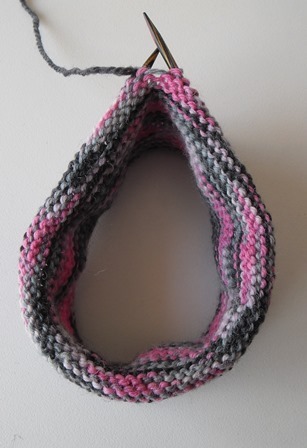 Over the last couple of months I have been doing a lot of knitting and searching out knitting patterns when I started thinking about the way the pouches are constructed and wondered if they can be done on circular needles. I did a quick google search and it turns out yes someone has now put instructions on how to do them on circular needles! The needles are so tiny only measuring just over 6cm from the cable connection point. The shop assistant warned some knitter’s don’t like using them as they are so very short. This is when she mentioned the magic loop method and demonstrated it for me. 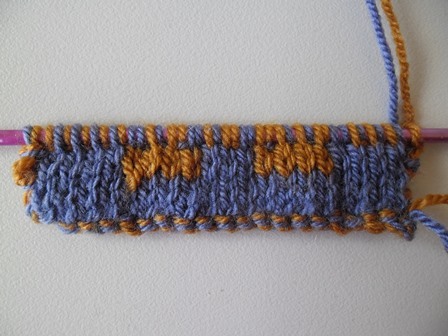 I decided to try the small needles and cable and turn to magic loop using my existing cables if it didn’t work. Once you cast on your stitches it looks like it won’t fit around to make the loop easily but remembering knitting stretches and these are tiny needle it works. There looks like there is a small little gap when you join your loop but they that closes up once you get into your second round. When I knitted my pouches previously I knitted over my tail end in the second row so it was one less end to weave in at the finish. You can do the same thing with this method. Even though your working on a small cable and shorter needles it isn’t fiddly. I like the feel of it in my hands. Every so often you need to slide the work around the cable when you feel like your starting to pull the stitches, that is easy to do and you get in the habit of regularly doing it even before it starts to pull. The reason I decided to try circular needles was so I only had one seam to do at the end which was the bottom seam to close the pouch off. The amazing shop assistant suggested I could do a 3 needle bind off which avoid having to do a bottom seam. I couldn’t believe it I could actually make a pouch in one hit with no additional seams at the end! Comparing the 2 methods of making the pouches the circular needles are defiantly the method I am using now. I must admit previously I was probably making my pouches a little large as I wasn’t sure how much they would come in once my seams were done. With straight needles I occasionally loose stitches or gain stitches the rectangles are not always straight therefore once seamed sometimes looks misshapen. With no side seams or bottom seam they are much lighter and less bulkier. The top of my pouch has curled a little and just reading the instructions now it says to purl so many rows at the start I’m guess that would so stop the curl. To be honest I am probably not going to do that. One of the reasons why I love knitting pouches is that you can go on auto pilot and you only have to measure once you know it is coming to the length you need. The curl is only small and doesn’t really make that much of impact. Pouches on circular needles is a life changer for me. I am actually doing more knitting of them now as I can pick up the needles and do a few stitches any time I have free. I don’t have to worry about finishing at row or turning my work. One thing I did find was it was easier to cast on my stitches using the cable as one needle and using the 3rd needle as a second needle to cast on. The way I see it is that I’m going to be casting off one pouch and casting on another immediately so that 3rd needle is out anyway. I still have a few rectangles that need to be seamed up but all future pouches will be made this way. 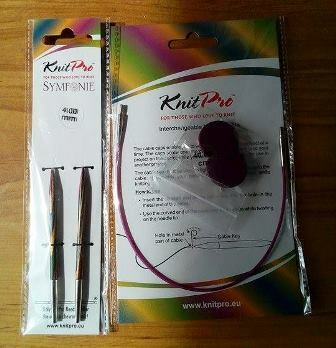 I may even invest in a second set of these smaller needles so that I will always have a pouch at a stage where I can just knit and not have to worry how long until I need to cast off, this is particularly important if I am taking my knitting out to a café or events with me. Double knitting is something I had never tried before, last weekend one of the very talented knitters in my Knitters Guild group ran a workshop on it so I had the chance to learn how to do it. 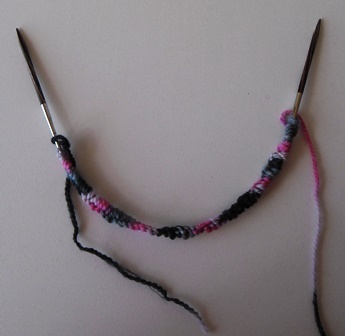 In double knitting you are knitting a double thickness of fabric. The way that you switch your yarns and stitches results in only the purl stitches (smooth looking stitches) showing on the outside of your work. It sounds complicated to get your head around and you cast on with 2 strands of yarn but treat them as one stitch which adds to the confusion. After the first few rows it starts to make sense. 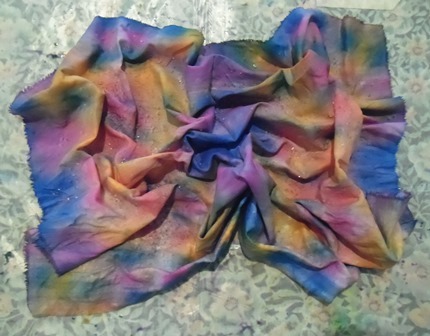 You can use this technique to make each side of the fabric a different colour the entire piece or you can twist your yarn colours around to form patterns within the piece. The result in a negative image of the pattern on the reverse side of the piece. In our workshop we worked off a chart to create a picture of a house. I only got the first half dozen or so rows done but I can see the picture starting to develop. Prior to the workshop I had seen items done with the negative image in reverse and I really liked it but I had no idea what it was called or how to do it. I really like double knitting now that I have learnt how to do it. To be honest I am not going to finish the house, I used scrap yarn and will take it off my needles and return it to my scrap yarn bag. 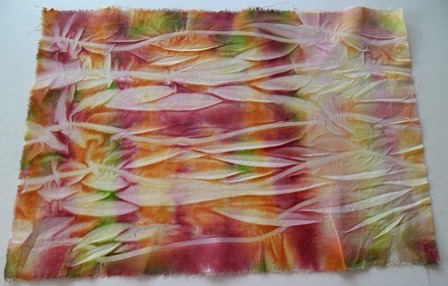 I do want to try this technique on a dishcloth or maybe get some 8 or 12 ply wool and make a hot pad trivet with it for the kitchen. It is very slow technique to work up in that you have to keep changing the yarn colours between your fingers and switching between knit and purl stitches. You have to really concrete on what you are doing so you don’t make a mistake in your pattern which means no auto knitting. I guess depending on the thickness of the yarn you use and how long you want to spend doing it you could make clothing other than scarves with the technique. I don’t think I would even have the attention span to do a scarf in it, a trivet I can handle. 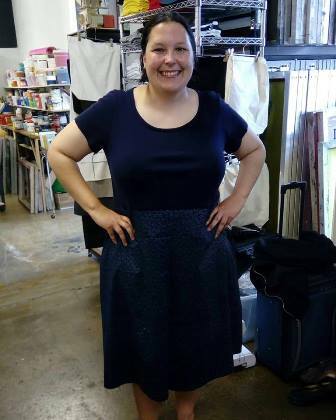 I have made myself clothing and it isn’t a skirt! This winter I think I want to wear vests at work. I like having my back and torso covered but I also like having my arms to have less bulk and coverage on them so vests are a good option. 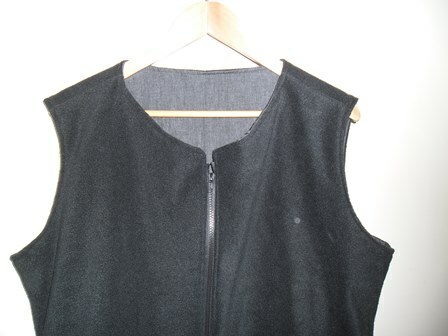 In the latest issue of One Thimble there is a vest pattern so perfect timing. 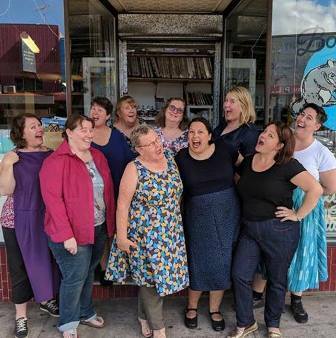 The pattern is Woman’s Hoodie Vest by Fat Red Bird. I decided not to include the hood as I wanted a more dressy look to wear in an office environment. 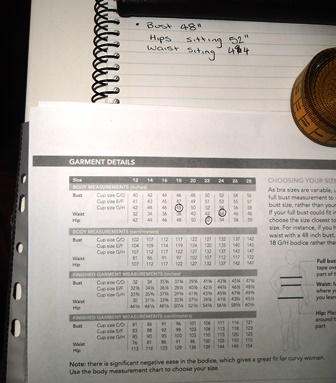 The pattern tutorial also has it with snap or button closures but I decided I wanted a zipper by chance Fat Red Bird have an excellent tutorial showing how to install a zipper into a lined vest, there is a link in the pattern to the tutorial. Using the basic pattern and the tutorial I was able to make my vest the way I wanted it. 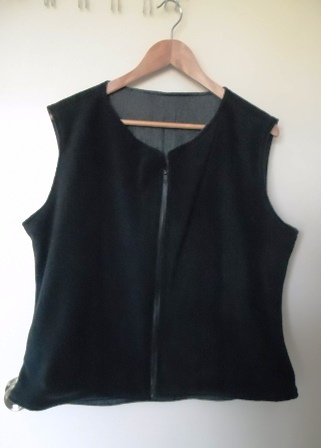 The outside of vest is polar fleece and the lining is denim. Confession my original intention was to have the denim on the outside and the fleece on the inside, however, when installing my zipper I accidentally stitching it the wrong way getting my right and left sides confused. The upside was I had stitched the zipper in really well so instead of wasting that good effort I reversed the fabric choices around. The pieces are exactly the same. 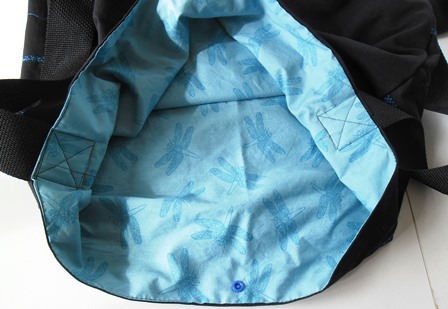 By using a double sided zipper you could make this completely reversible. 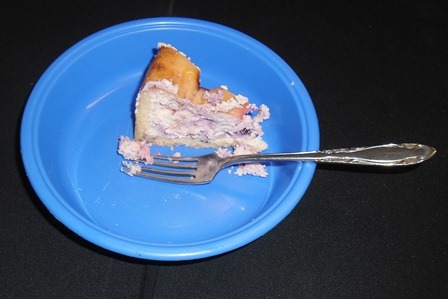 Last weekend I attended a 2 day workshop with Anne Mitchell owner of Genesis Creations. 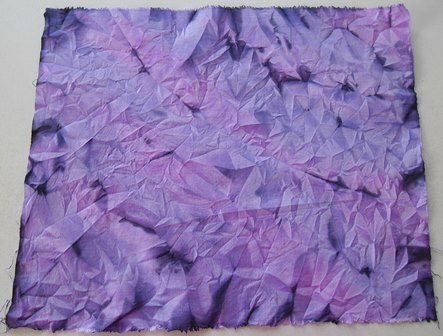 Back in February I saw Anne demonstrate Liquid Radiance, a fabric paint that is similar to a fabric dye but it isn’t a dye. Liquid Radiance is non toxic and Australian made and owned. I fell in love with it the moment I saw it and couldn’t wait for the work shop. Day 1 was all about learning the basics. 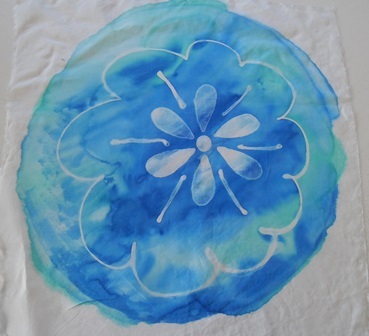 The first thing we were taught was how to apply the paint to the fabric. You can dap it on in sections and spread with a paint brush or use the even more handy method (excuse the pun) the 5 finger foam brush which is essentially your hand in a rubber glove. Liquid Radiance is very concentrated and you only need a tiny amount to give you coverage. 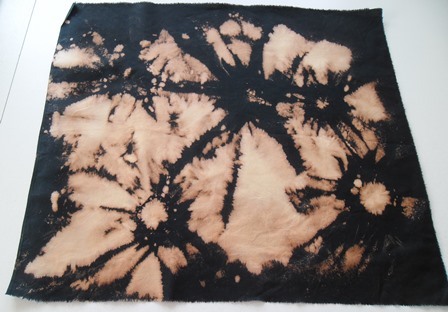 If you use too much of it not only are you wasting the products your actually making your fabric look dull and have a plastic feel as Anne drums into you “Excess is the Enemy” After you apply the paint the way you handle the fabric next will determine what patterns you get. 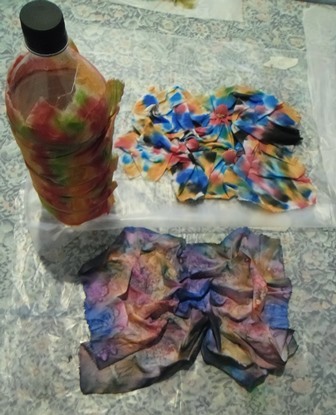 You can wrap your fabric around objects such as bottles or pipes (even a tree) and use rubber bands or strings to create patterns. 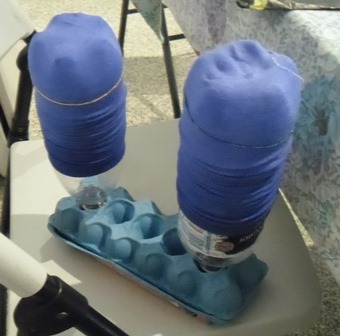 We made a funky pair of socks by sticking the coloured socks over the end of a empty bottle and scrunch them up. 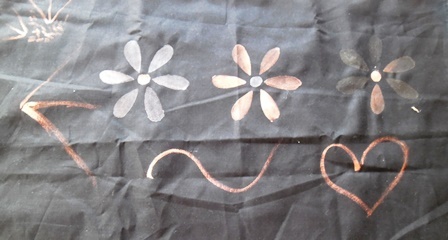 One of my favourite things was heliography where you place objects on your fabric to create patterns. You place it out in the sun to dry. 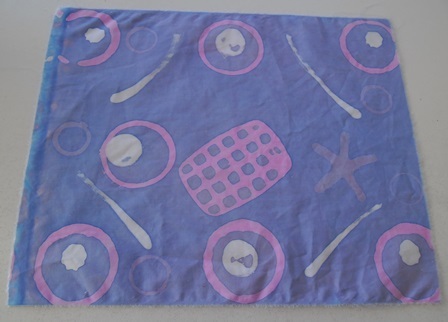 Afterwards you remove the objects and the shapes still appear on the fabric. 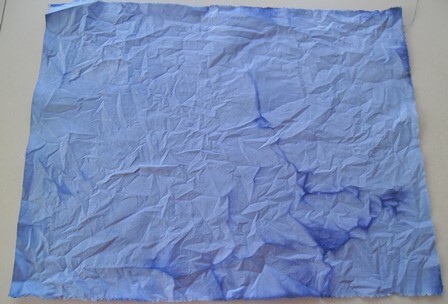 Another method we tried called air exclusion is where you crumple the fabric up and stop the air from getting to it. 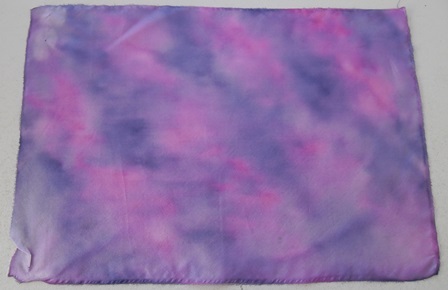 Once the fabric is dry and pulled open it gives a gorgeous crystal effect. 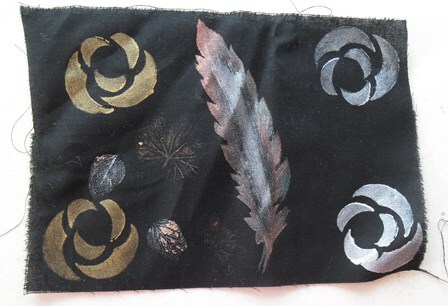 Other ways to create patterns in the fabric is to wrap objects in them and place the paint over the top. We tried this with marbles. The colours I chose don’t really show how effective this can be. 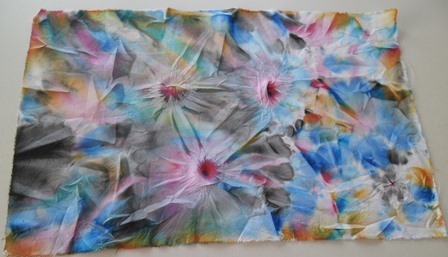 You can form flowers or sun bursts if you choose the right colours. 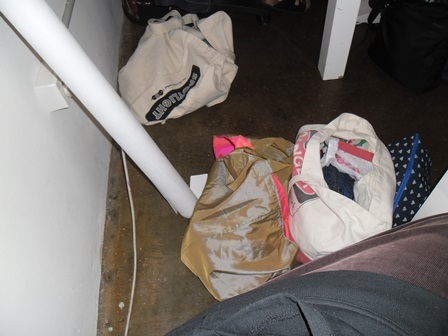 One thing I was surprised about was how quickly things were drying inside. 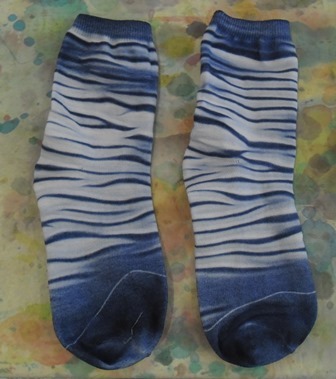 Pieces that were lying flat were dry by the next morning (or even later that day) The socks were dry overnight. 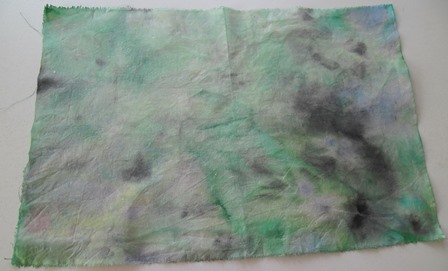 The more crumbled or scrunched an item the longer it took to dry however it didn’t take too long. I did have some pieces drying for a day or so when I got home. With Liquid Radiance you do need to heat set the items. 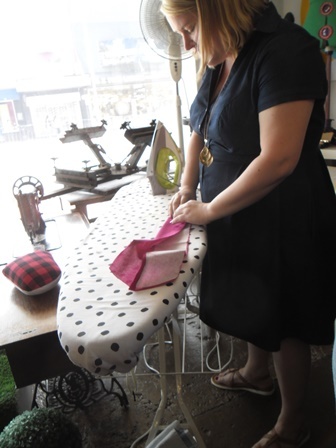 This can be done with an iron or for non ironable items a hairdryer. I ironed them when I got home. Once they are heat set they are fine to be washed. It was the first time I’ve ironed socks but yep even they needed to be heat set. 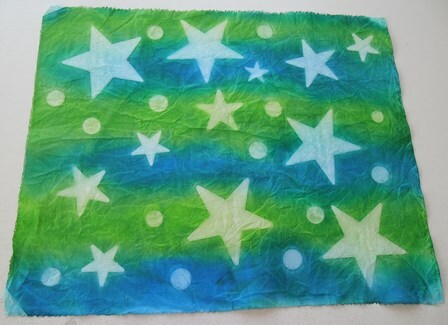 Other time the mop up fabrics turn out ugly. 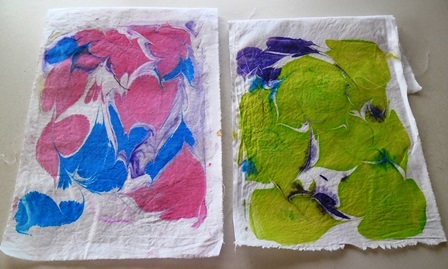 It really depends on if your wanting to use them as a feature piece in your work or if your treating them as a rag cloth. 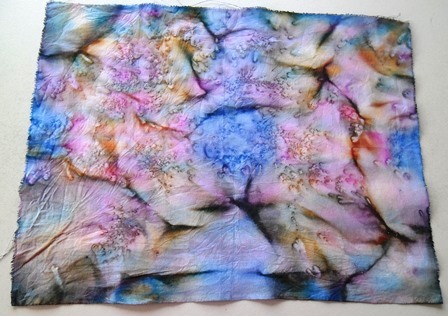 This piece was a rag cloth for me but I guess it would make a nice piece if it was cut up. I had so much fun on day 1 of the workshop. I must warn you it is a busy day as Anne has so much she wants to teach you and is so passionate about it. She gives you a list of items to bring to the workshop and if you have prepped them like she said it makes for a smooth day. At the end of the day your brain is buzzing with ideas it is fantastic. She gives you lots of hand outs so you can remember how to do things when you get home.